Serendipity Reviews: As NaNoWriMo approaches! It is that time of year again, when many authors published and unpublished enter a writing frenzy as they try to write a first draft of a book in 30 days! Madness, I hear you say, yet I can promise you it can be done. I managed it last November along with a few writing buddies and I plan to do the same again this year. Now having a year of NaNoWriMo already under my belt, I wanted to offer a few snippets of advice as well as provide you with some inspirational blogs and websites that I really think will help you along the way. So my advice first. You don't have to take it, but it might help. Link up with as many other bloggers and writers that you know who are alos taking part. Writing is an extremely lonely business, and it helped so much to be writing alongside other bloggers. I am positive we all spurred each other to the end. Plan your story a little bit before hand. If you are doing this for a laugh, then fly by the seat of your pants. If you are desperate to have a finished, plausible first draft at the end of it, then take some time to plan it before hand. Try and work out beforehand when you will write. Where can you fit that hour in so you can keep up with your daily word limit. Increase your daily word limit a little to allow you days off throughout the month. Sometimes you know that there are going to be days you just won't have time, so why not try writing a little extra on the days before it to help you stay on target. I hope that helps. I also want to provide you with some inspirational blogs written by four authors who keep me writing. The Zoe-Trope Zoe is one of my favourite authors and a good friend on Twitter. When I struggle to write, I turn to her and her words of wisdom. She writes fantastic posts on her blog about different aspects of writing, which I recommend you read. Sarah Alderson This woman is seriously a writing machine. Before she wrote her first book, Hunting Lila, she had never written before. Two years later, she has six books under her belt. If you are looking for someone to spur you on and show you that anyone can do it, Sarah's blog is the one for you. Jody Hedlund I am not sure how I came across her blog, but I am so glad I did. Jody is amazing at writing inspirational post about how she writes. Nicola Morgan - is an award winning author with over 90 books under her belt who gives us her advice on our 'Write To Be Published@. Not only is this a blog, but you can also buy the book too. Also , here are a few of the recommended NaNoWriMo blogs which are worth looking at now. Storyfix.com - this is a great website that is providing daily tips to help you prepare beforehand for NaNoWriMo. The Office of Letters and Light is the official blog that runs alongside NaNoWriMo. Writing Fiction Right is written by the author Gail Gaymer Martin, who gives us lots of writing tips. Procrastinating Writers This site has some really helpful tips for NaNoWriMo, so definitely check it out. Wrimos FTW Written by Lyn Midnight, this is a blog that builds up excitement about NaNoWriMo and helps you to prepare. If you are looking for a book that might help you through the month, then please invest in No Plot? No Problem by Chris Baty,, He is the founder of NaNoWriMo, so he knows what he is talking about. I found it very interesting to read this book before I started. I hope this post has been helpful and that you are all now raring to go with you writing. When you have signed up for a month of merriment, please come and find me, my user name is viviennejane. If you have any other useful tips or blogs to help us all, then please leave a link in the comments. Good luck, Vivienne! You know I'll be cheering for you. Some sound advice, thanks Vivienne. Here's to another great event. 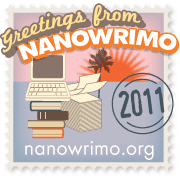 I'm doing NaNoWriMo again this year, too! Very excited! Thanks for all the great links!